Fiction – hardcover; Penguin Canada; 374 pages; 2014. 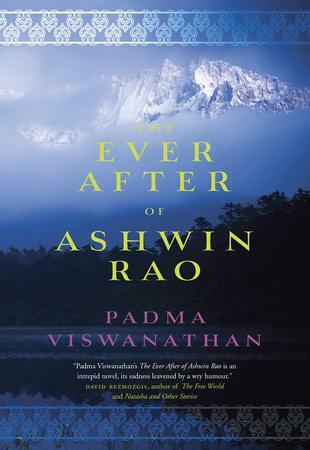 Padma Viswanathan’s second novel, The Ever After of Ashwin Rao, has been shortlisted for this year’s Giller Prize. The Ashwin Rao of the title is an Indian psychologist who returns to Canada — where he trained — to do a “study of comparative grief”. Rao wants to find out how these people coped — “by what means did they go on?” — but his study is not exactly objective. He, too, lost family members in the tragedy — his sister and her two children — but he’s not always forthcoming about this, because he wants to keep his “professional distance”. But as the story progresses it becomes clear that in examining other people’s grief he is essentially exploring his own — even if he might not know it. The novel, which spans summer 2004 to spring 2005, is structured around Rao’s interviews with survivors. Their individual stories — how their loved ones came to be on the flight, how they coped in the aftermath of the tragedy, what their lives have involved in the 18 years since — are “imagined” using a psychological technique Rao has been practising for his entire professional career. But I keep a journal differently. I note, on a left-hand page, an anecdote — something characteristic or outrageous a friend or family member said, or perhaps a confidence told to me. On the facing page, for as many pages as it takes, I properly tell the story: third-person, quasi-fictionalised, including matters not witnessed, details I can’t really know, and so try to explain what I have seen or heard. These stories are mostly unbearably sad but are lightened by a wry sense of humour. They are interleaved with Rao’s own story — his life in India rife with political and religious tension, the freedom he discovered in Canada when he arrived in 1969 to study medicine, the love affair he had with a Canadian woman who went on to marry someone else — in a voice that is distinctive, self-deprecating, occasionally angry, often melancholy, opinionated, philosophical and a little old-fashioned. Unfortunately, Rao’s voice eventually gets subsumed by a larger story — that of Professor Sethuratnam, his daughter Brinda and his cousin Venkataraman, whose wife and son were killed in the tragedy — which comes to a rather unexpected and somewhat unbelievable conclusion. While The Ever After of Ashwin Rao has worthy aims — to explore the notion of grief, to look at the long-lasting repercussions of terrorism, to examine multiculturalism and religion — the execution is confused and the narrative occasionally lacks focus. This is not to say it is a bad book — it’s far from that, as its prize listing would suggest — but it demands the reader’s full attention without necessarily offering much of a reward. Admittedly, I only continued reading it as part of my Shadow Giller jury obligations — I fear I may have abandoned it otherwise. This is the only Giller shortlist title remaining for me and I am afraid your review confirms impressions I already have from others that I had best be prepared for it to be a challenge. A very good friend and respected reader who definitely knows her books says she abandoned this one, so your final para struck a responsive chord with me. There’s a good story in here dying to get out, but it’s confused and the too-neat ending is, I’m afraid, a bit of a turn-off. Am looking forward to seeing what you think of it when you finish. Having seen the author this past weekend on a panel at Wordfest, my impression from her contributions and reading is that she is shooting above her age and skill to be able to carry off the complexity of the story and the voice. It was one of those panels where one author (Miriam Toews) so out weighed the experience and presence of the others (Alison Pick was the third writer). Ah, that’s interesting… The book is rather ambitious in scope and style, and I admire that, particularly as this is only the author’s second novel, but I just didn’t feel it was cohesive enough. It was excellent in places, and I liked the voice of Rao (even though he was often pretentious and obnoxious), but the sum of its parts didn’t add up to the whole. I do suspect that she’s an author to watch, though.